Watching yourself on television is a very strange thing. I suppose actors, newsreaders and the like are used to it, but not me. Not being sure if you will be there or not, pointing at the screen every two seconds so you start to look like you’re performing some half-arsed military salute, it definitely feels strange. This would probably be the right time for me to backtrack a minute and tell you what I’m talking about. In the Easter holidays, my friend heard a rumor that they were filming Sherlock near us, so we met up to go and watch … and because having people standing around watching wasn’t doing the BBC many favours, and their crowded scene was somewhat short on people, I got invited to be an extra. The blur you can see with the green ring around it is me. Well, my right arm. 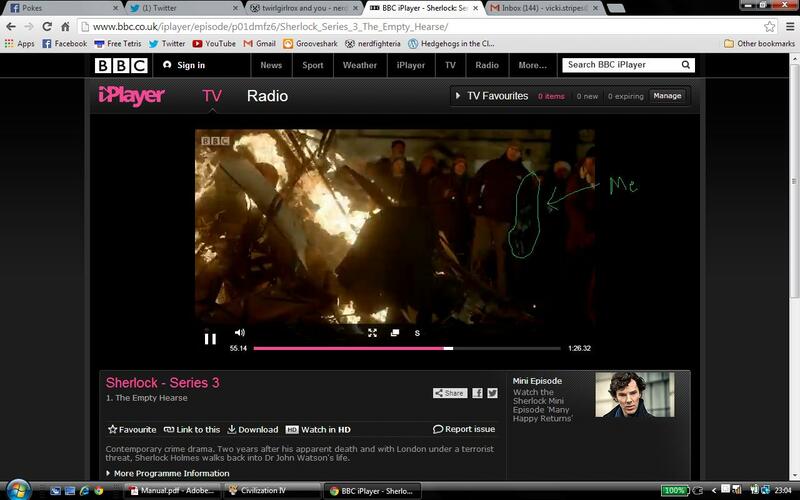 Personally, I count being in Sherlock as a pretty awesome television debut. So far, I’ve seen myself in two gifs, which probably isn’t very many, but far more than I’d expected. Bearing in mind how, on the day, I’d turned up at 11:00 am expecting having been fed a red herring, thinking me and my friend would just catch up with talk, about our separate schools, and about being mildly disappointed about being misinformed, it was an amazing day. Without a day, one of the best days of my life, and one I’ll never forget, but also very surreal. I woke up the next morning, having been out from 10:30-2:00 am, not entirely sure if it had even happened at all. I had been, again at her invitation, to see something else being filmed the previous summer, (Dr. Who Christmas Special where we meet Clara), but that was totally different and much more widely known about. Both were amazing, but totally different experiences. I’m not sure that standing out in mildly dubious public places in the dark and cold at one in the morning is most people’s idea of fun, but in some circumstances, it can be a brilliant thing.